We've spent a few weeks accumulating mountains of food in our spare bedroom, and now it's time to sort it into individual resupply boxes. Even with many years of backpacking experience, this task is one of the most daunting of our PCT preparation. We know what we like to eat on the trail, and we have a pretty good idea of how much we'll eat each day. 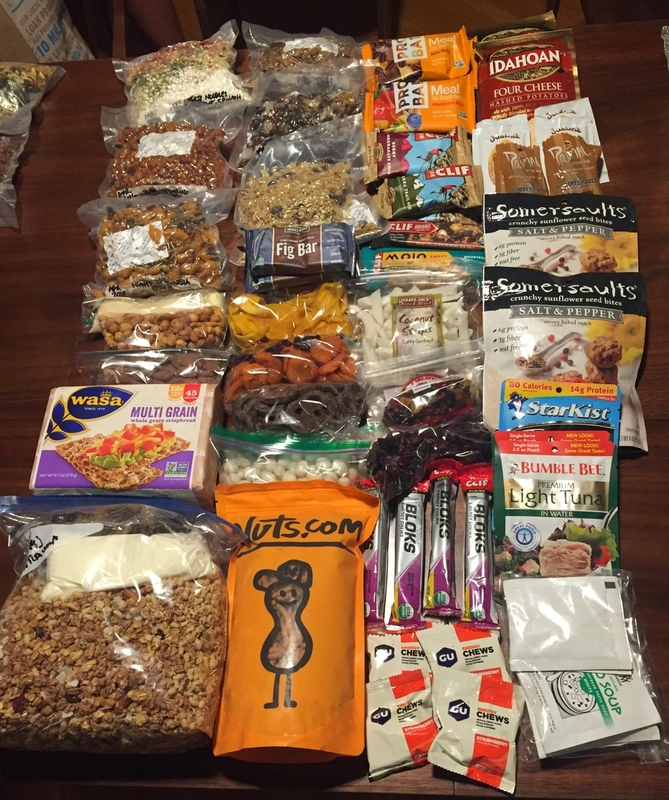 However, estimating how many days it might take us to hike between resupply points and deciding how much food to put in a single box to cover a variable range of days feels like a big responsibility. We never want to run out of food, and want to minimize the need to start rationing more than a day out from the next stop. On the other hand, overestimating means carrying extra weight and potentially discarding food if multiple boxes in a row have more than we want to eat. Another wild card is that we'll have the option of buying some food along the way and we are likely to eat with friends or at restaurants in some places. It's hard to know how/whether to factor that into our resupply boxes. Dinners first, since they're self-contained. One for each expected day. No repeats in adjacent resupply boxes. Add a small bag of Parmesan cheese for any pasta dishes. Throw in a few packets of sambal oelek for extra flavor. And one Idahoan instant mashed potatoes for every few days. Oh, and several packets of miso soup mix. That allows for some flexibility in hunger levels - we can choose to have multiple courses, or not. Pro tip: There is a great online resource, Minimus for getting single serve packets of almost anything. We found the sambal oelek there. Breakfasts next. Grab a few kinds of granola/cereal, and scoop ~1 cup per person per day into a gallon-sized Ziploc with slider top (more robust to get in/out of daily). Add a heaping spoonful of powdered milk per person per day into a sandwich bag. Put an appropriate-sized handful of dried raisins & berries or freeze-dried fruit (bananas, peaches, berries) into another sandwich bag, and then put both small bags into the gallon bag with the cereal. Done! Each morning we'll scoop out servings from each bag. Serving size on any given day will be dependent on hunger levels and also how close we are to the next resupply point, but we'll target ~1 cup servings if we are on schedule. Along with breakfast goes bulk loose tea leaves (TeaSource) for Andrew and a sufficient quantity of instant espresso powder (Medaglia d'Oro) for me. Finally, the rest of the day's meal(s). When backpacking, we tend to stop for food every hour or so. We joke that our days consist of a little hiking squeezed in between eating tensies, elevenses, lunch, 2nd lunch, afternoon snack, high tea, and pre-dinner! The volume of so-called lunch food needed will vary depending on terrain, season (& expected weather), and where we are along our overall trip. "Hiker hunger" really sets in after a few weeks and we know that by the halfway point we'll be eating enormous amounts of food. These boxes are relatively early in the trip, so we're filling them with a moderate volume of food. Each day has a pair of bars to share, a serving of "crunchies," a serving of protein, and some type of fruit. On top of that, we'll include something sweet for ~75% of the days, and a selection of energy chews to provide a late-afternoon pick-me-up. Each box has a few extras from one or more categories, to account for being on-trail for more days than expected, and/or being on schedule yet extra hungry. And finally, we'll throw in a little drink mix for those moments we want to drink something that is cold but not water.